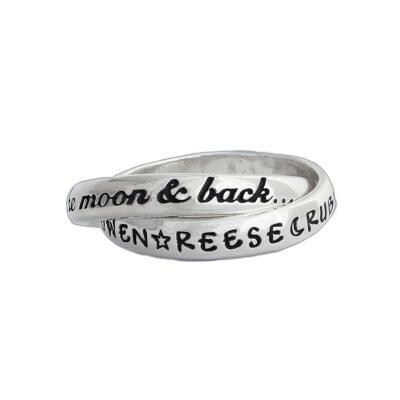 "Grandmother's Ring, Personalized and Stamped with I Love you to the Moon and Back"
What a sweet and wonderful phrase. Show everyone who you love to the Moon and Back. Great gift for Grandma. Our personalized grandmother's ring shows who you love to the Moon & Back. Say it simply on our double ring. One ring has written in script "I Love you to the Moon & Back…". The other band can be stamped with up to 18 characters/spaces. What a sweet piece of jewelry with your grandkid's names. Insert symbols as separators between names. There will be a slight space before and after the symbol to separate it from the letters. Personalize this ring with names, nicknames, dates or special words. Customize with the names of those you love. Dimensions: The sterling silver bands are approx 4mm wide and can be stamped with up to 18 characters/spaces. Please note the bands are interconnected and will alwasys move around. The same band will not always be on top.